Do You Really Need A New Carpet ? Mold is a type of fungus that can be found growing in a variety of places that have moisture. It is most commonly seen on food that has not been properly preserved. It will usually be white or green, with a fuzzy or dusty appearance, which makes it easy to spot. Fruits and vegetables are particularly susceptible to mold, so it is important to regularly check for mold, even if the items have been refrigerated, since refrigeration will only slow down the growth of mold, rather than stop it entirely. It may be surprising that one of the biggest causes of household allergies is actually microscopic. Dust mites are so small that they cannot be seen with the naked eye, but they are rampant in houses. They feed on dead skin that has flaked off both humans and pets, so are most often found in bedding, furniture, and carpets. Any place in the house that might collect flakes of dead skin will also be a breeding ground for dust mites. It is a fact of life that carpeting and children don’t always work well together. At some point, children will spill juice, drop food, or track mud on a carpet. It can be a full time chore just cleaning up spills and stains on carpets as soon as they happen. Unfortunately, it is another fact of life that you may not necessarily find that juice stain right away, so it may have already set into the carpet. Combine all this with normal carpet wear and tear, pet stains, and adults who also spill drinks and track mud and dirt in, and the result is a dirty, smelly carpet that is in sore need of a good cleaning. Many people may think that carpet cleaning at home is the same as carpet cleaning in commercial buildings, such as offices. The truth is that while home carpet cleaning is necessary from time to time, it is usually just for the benefit of the homeowner. On the other hand, businesses have a certain reputation to maintain with their vendors, clients, and other visitors. This reputation includes everything from the lighting, to the noise level, to the office layout, to the carpet. If the carpeting in a business office is worn, dirty, or smelly, it will give the impression that the people who run the business in that office are not very professional and do not care about the upkeep of their working environment. Carpeting in commercial buildings, particularly hotels, is just as big an investment as home carpeting, if not even more so. The look of the carpeting in a hotel says a great deal to guests about what they can expect from their stay there. Dirty, stained, or smelly carpeting in hotel rooms, hallways, and lobbies will invariably lead guests to wonder about the cleanliness of the rest of the hotel. On the other hand, clean, spotless carpeting will help put guests’ minds at ease. 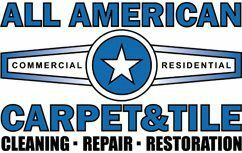 All American Carpet & Tile understands that it isn’t just homeowners who have a need for professional carpet cleaning services; renters want clean carpets as well. This is particularly important to keep in mind, given that the National Association of Realtors has seen a rise in the number of renters compared to owners. These renters will want the same benefits of professional carpet cleaning that homeowners enjoy. The bottom line is that even carpets in rented apartments will sometimes need professional help to look their best. Why Carpet Cleaning for Apartments? There are a number of reasons why people might wish to enlist the services of a professional carpet cleaner for a rental apartment. Many people may think that a water stain on carpet does not need to be cleaned, since water is colorless. In fact, even spilled water can show on carpet. 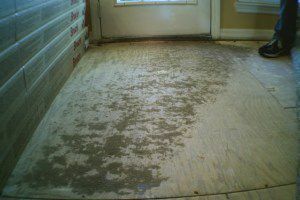 The water may loosen up bits of dirt trapped in the carpet and bring them to the surface. There may even be bits of sediment in the water that will show on light-colored carpet. Additionally, spilled water that is left on the carpet may eventually seep through to the padding underneath, causing the growth of mold and mildew in the carpet itself. In particularly bad cases, this can even present a health hazard. Fortunately, water stains can be cleaned quite easily, even if they have already dried. A stained carpet or rug can ruin the beauty of a home. It may seem that you will have to spend a lot of money to hire professionals to restore your carpet or rug to its former appearance. In fact, some stains can be removed with simple household items, so long as the stain is not too old or large. Vinegar is one of the most common household items that can be used to clean carpets or rugs. Its high acidity (2.4 pH) makes it ideal for cleaning most stains, killing germs, and softening fabrics. Additionally, it is not toxic for children or pets, unlike other harsh cleaning agents. A good vacuuming will remove any excess loose dirt or debris from the stain. If the stain is on a rug, lift the rug up to vacuum the back side as well. Tough carpet stains and odors may seem to be immune to all cleaning attempts. However, there is a common household item that can work wonders to remove the odor from pet accidents, the dirt that the kids tracked onto the living room carpet, or the motor oil left on the bottom of your shoes after working on the car. Baking soda can work wonders to restore your dirty, smelly carpets to a clean and fresh state. There are a few simple steps to follow.